CDOT conducts a continuing, comprehensive, and cooperative (3C), performance-based, multimodal transportation planning process in accordance with federal and state requirements. The process provides for broad public involvement in the key decisions made for Colorado's transportation system, including the development of both long-term and short-term performance goals and objectives, the identification of strategies to achieve those objectives, and priorities for investment in transportation programs and projects. The results of this process include the development of several required planning products including a Statewide Transportation Plan (SWP), Regional Transportation Plans (RTPs), and Statewide Transportation Improvement Program (STIP). The most recent federal transportation legislation requires a performance-based approach to planning. Colorado's multimodal transportation planning process reflects this approach by incorporating extensive use of data and analysis to inform decision-making, including the establishment of performance goals and objectives, the distribution of resources, and project selection. The multimodal transportation planning process is coordinated by the Multimodal Planning Branch (MPB) in the Division of Transportation Development (DTD), in conjunction with the CDOT Regions and other areas of CDOT. The multimodal transportation planning process includes extensive coordination both internally and externally. Primary internal partners include the CDOT Regions, Division of Accounting and Finance (DAF), Division of Transportation System Management & Operations (TSMO), and Division of Transit & Rail (DTR). External coordination includes planning partners, other stakeholders, and the public. 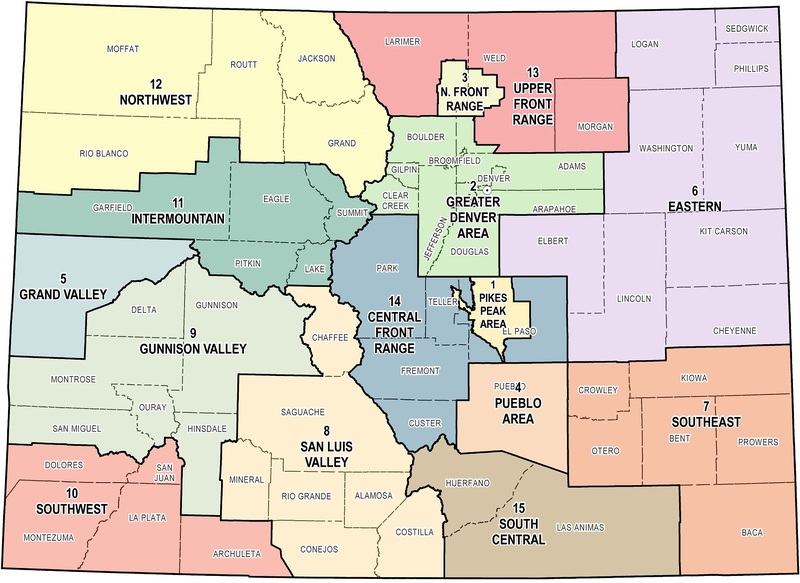 The MPB coordinates planning activities, integrates planning products from different CDOT Regions and Divisions, incorporates input from planning partners, other stakeholders, and the public, and provides analysis and policy development based on a consolidated, statewide, multimodal perspective. State and federal revenue forecasts are developed for the minimum 20 year time horizon required for the SWP and RTPs. Annual short term revenue forecasts are developed for the annual budget. Data collection and an analysis of needs are conducted to assess the current and future transportation conditions and demands for the next 10 and 25 years, including analysis and projection of system condition, congestion, safety, Vehicle Miles Traveled (VMT), population, and other demographic information. Analysis from the Statewide Travel Model, including scenario analysis, are incorporated. Projected condition data and funding needs from compiled from various sources, including planning partner input, and are incorporated into the needs analysis. Funding needs are identified, including funding needed to achieve established performance objectives, and the gap between needs and forecasted revenues. Data and analysis are also used to identify trends and themes for further consideration and discussion in the SWP, RTPs, and other plans. Goals, and performance measures and objectives are developed in the areas of safety, infrastructure condition, system performance, and maintenance and incorporated into Policy Directive (PD) 14.0. Additional areas, including Economic Vitality, are anticipated in the future. PD 14.0 provides an overall framework for the transportation planning process and guides the distribution of resources in the SWP, STIP, and annual budget. PD 14.0 is updated periodically to reflect new or updated measures and objectives. The development of goals, and performance measures and objectives is based on the results of data collection and needs analysis, revenue forecasts, and information from existing plans. Program Distribution is developed, outlining the estimated assignment of forecasted revenues to programs for the minimum 20 year time horizon of the SWP. Program Distribution is developed based on forecasted revenues, the funding needed to achieve performance objectives, and planning partner input. Funding by program is identified and provides the basis of fiscal constraint for the SWP, RTPs, and STIP. An annual budget is developed, and adopted in the spring of each year. The annual budget is based on updated revenue forecasts, and on updated information on funding needed to achieve performance objectives. The annual budget for each year replaces Program Distribution as the fiscal constraint for that year in the STIP. RTPs with a minimum 20 year time horizon are developed/updated by the Regional Planning Commissions (RPCs) of each of the state’s ten rural Transportation Planning Regions (TPRs) and by the Metropolitan Planning Organizations (MPOs) of each of the five metropolitan areas. MPOs develop their plans in cooperation with CDOT, while CDOT assists the TPRs in developing their RTPs. RTPs identify a vision for the region, priorities for needs, programs, or projects, and strategies for achieving the vision. The development of RTPs includes significant stakeholder and public outreach. Modal Plans are developed/updated for transit, rail, aviation, and bicycle/pedestrian modes. Functional Plans are developed/updated for specific transportation functions, including the Strategic Highway Safety Plan, Statewide Transportation System Management & Operations Plan, Risk-Based Asset Management Plan, State Highway Freight Plan, and Multimodal Freight Plan. The SWP is developed/updated incorporating the results of Data Collection and Needs Analysis, Goals, Performance Measures and Objectives, and the Program Distribution processes. The SWP integrates the RTPs, modal plans, and functional plans. The SWP identifies a vision, goals, measures, and performance objectives for the transportation system, future needs for the transportation system, trends affecting transportation, and an investment strategy and strategic actions to achieve the vision and goals. The SWP and the RTPs have a minimum 20 year time horizon. The development of the SWP includes extensive stakeholder and public outreach, coordination with planning partners, and with the development of RTPs and other modal and functional plans. The Development Program is developed in tandem with the SWP. The Development Program serves to bridge the gap between the long-range SWP and the short-term STIP. It identifies the needs and priorities for major investments in multimodal corridors and projects over a ten-year timeframe. The Development Program is constrained to a “high-revenue scenario” meaning that projects and program funding are identified above the level anticipated by the fiscal constraint established by Program Distribution. This provides the opportunity to plan for the possibility of additional, unexpected revenue becoming available. The STIP identifies capital and non-capital transportation projects and programs proposed for funding under Title 23 and Title 49 of the U.S. Code, as well as all regionally significant transportation projects requiring an action by the FHWA or the FTA. The STIP incorporates the Transportation Improvement Programs (TIPs) developed by each MPO. TIPs and the STIP must be fiscally constrained. Fiscal constraint is established by Program Distribution and is modified annually based on the annual budget. The STIP aligns with and is guided by the goals and performance objectives in the SWP. Projects are identified through asset management systems, TPR input, MPO project selection processes, and other data-driven or competitive project selection processes. The draft STIP is developed through the 4P (Project Priority Programming Process) which includes county, TPR, and CDOT Engineering Region level meetings to review proposed projects and obtain public and stakeholder input. The 4P process follows and is informed by the development of Transportation Plans and the Development Program. The STIP is amended twice per year, or as needed, and readopted annually to add a new year of projects, thereby maintaining four years of programming. Transportation Plans, including the SWP, RTPs, modal, and functional plans, identify strategies to achieve goals and performance objectives. CDOT staff and planning partners undertake implementation activities to make progress in achieving goals and performance objectives. Implementation activities vary. Examples include: the deployment of new operational strategies, studies on emerging transportation issues, or improvements to data collection and analysis. Progress in implementing plan strategies is continuously monitored and reported, as is progress in meeting performance objectives. Performance reporting and monitoring is used to communicate progress and performance to the public and planning partners, identify the need to make changes to performance objectives, and inform investment decisions including the development of the annual budget.